I am a bit confused about how HDR (on TV) works. The way I see it, multiple images of the same frame are used to create one image which shows better details in low-light and high-light areas of the frame. Why does the TV have to do anything about this? Shouldn't all movies that have HDR be preprocessed in this way so the resulting movie looks exactly like it should? Or does HDR on TV really mean that these multiple images per frame are available to the TV and the TV figures out how to combine them? The answer by James Snell is pretty severely incorrect to say that photo and display HDR are unrelated. They both refer to the exact same thing: higher bit depth. When you create an HDR image, you use the multiple exposures to create a true HDR image that has a higher bit depth than a normal display can reproduce. Because of this limitation, you normally tonemap the actual HDR image back down into the low dynamic range space of a normal display. What an HDR display allows is to display the HDR image natively without the tonemapping step (assuming the bit depth of the display is greater than or equal to that of the image), whereas on a normal display you're really only able to see a simulated HDR image. tl;dr HDR = higher bit depth in both contexts. It's not a different meaning at all. HDR-TV is (yet) another standard of video transmission. The color gamut is wider (see rec 2020 vs rec 709) but so is the resolution. The standard is supposed to be backwards compatible which means you will only see the benefits of the wider gamut if you have a television that supports it, but if you don't you will still be able to view the stream in the narrower gamut. The standard will necessarily expand the bandwidth required to carry or transmit the signal. HDR-TV (rec 2020) also defines two pixel resolutions (4K and 8K pixel widths) which are higher than the standard HD-TV resolution which is closer to 2K pixels wide. The standard is in its infancy and will likely evolve through several generations before it matures. Reviewers are typically impressed with the extended gamut and have said that HDR-TV is a much more noticeable improvement to quality than higher resolution alone. 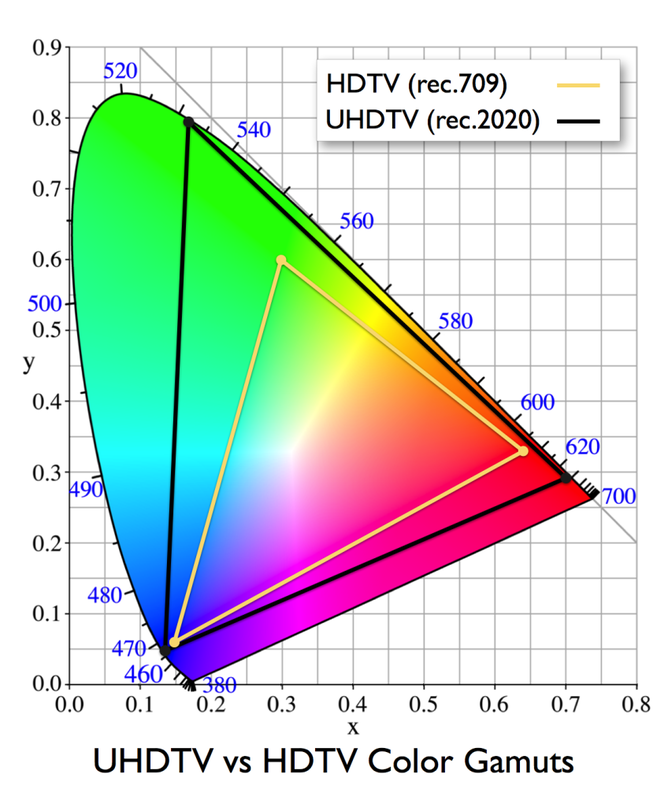 HDR-TV provides the UHDTV color gamut as shown in the attached image. Essentially, it boils down to the bit-depth being 8 bits per color channel for rec 709 and either 10 or 12 bits per color channel for rec 2020). As of July 2016 another standard has entered the industry (rec 2100). Rec 2020 and rec 2100 both feature the same wide color gamut (WCG) and it is typically the extra colors that are implied when HDR is mentioned. However, it gets more confusing than that. Both rec 2020 and rec 2100 support frame rates from 23.976 up to 120 and only progressive frames, never interlaced which you may be familiar with. This is another improvement over rec 709 which was only up to 60p. Rec 2020 only defines 2 resolutions 4K (3840x2160) and 8K (7680x4320), while rec 2100 also defines 2K (1920x1080), thereby bringing the wider color gamut to what we already refer to as HD. The signal formats for rec 2020 include RGB and YCbCr, while rec 2100 also defines a third format, ICtCp which provides an improved color representation. In particular, rec 2100 defines two optical transfer functions that are different from rec 2020; perceptual quantization (PQ) and Hybrid Log-Gamma (HLG). I'm not sure when this happened but it seems that rec 2020 is referred to these days (at least on Wikipedia) as standard dynamic range (SDR) and rec 2100 is high dynamic range (HDR), but since UHDTV "HDR" television sets existed prior to the release of rec 2100 it is possible that your "HDR" set supports rec 2020 and not rec 2100. Furthermore, both rec 2020 and rec 2100 can represent the same colors within the triangle of the CIE 1931 chromaticity diagram pictured above, what is different is the optical transfer function and the gamma ramp, so in other words, the function that converts signal to color is different. This is one of those many times when terms/acronyms get applied by different audiences to different things. You're referring to image compositing and tonemapping to exceed the standard sensor range as HDR. The electronics industry are using it to refer to the HDMI HDR specification which enables greater bit-depth - aside from the wording behind the acronym there is no relationship between the two. The short answer is that the terms are substantively different in meaning, both technically and subjectively. However, HDR for TV is certainly not just a marketing term, and I can't think of a more appropriate term for what HDR capable TVs are offering. I began working with high dynamic range imagery for feature film production at Digital Domain based on the work of Greg Ward Larson, and Paul Debevec back in 1999. I think I was the first to develop a process for lighting CG with HDR images in real time using preprocessed spherical convolutions of HDR environment maps (boy that's a mouth full). If I recall correctly Paul did a paper on HDR for real time in 2001, so there were probably a number of people who were doing similar things around that time. In the same year, 2001, I did a panel on the future of color at SIGGRAPH with Roger Deakins originally, but Allen Daviau filled in last minute when Deakins was pulled onto "A Beautiful Mind". Also on the panel was Neil Robinson (then from ILM), and Beverly Wood from Deluxe Laboratories. So I've been involved with HDR as originally defined from pretty close to the beginning, and I've had the opportunity to learn from some amazingly talented people. As it relates to the usage of HDR for TVs and modern consumer distribution channels I've recently had the opportunity to work with Jenz Merrill who is in charge of the HDR pipeline for Amazon Instant Video which is the first commercial HDR delivery, and I'm also good friends with Thad Beier who is the Director of Imaging Platform Workflow at Dolby Labs. Although I'm not directly involved in the work at Amazon or Dolby Labs, and just to be clear they are different workflows, I've seen what's being done and I can say the results are spectacular. One Example from "Mozart in the Jungle"
I've recently seen some of the work Amazon has done over at Technicolor, and it is beautiful. In the color suite Technicolor had an HDR monitor next to a standard HD monitor, both calibrated perfectly, and both looked beautiful. One shot in particular from "Mozart in the Jungle" stands out. The shot is inside a library and on the perfectly calibrated studio grade HD monitor it's beautiful, warm colors, great composition, all in all a fantastic shot. However on the HDR monitor it's breathtaking. Typically a very good HD tv can output up to 400 nits of brightness (one nit is equivalent to one candela or candlepower per square meter). I'm viewing this web page on a MacBook Pro Retina display at full brightness and reviews say that it's about 300 nits. I'm told the HDR monitor that I saw at Technicolor was 1100 nits! Not mere percentages brighter but nearly 4 times brighter then my MacBook pro, and nearly 3 times brighter then a top of the line HD tv. Even more dramatic is the fact that this additional brightness does not come at the cost of increasing the brightness of the dark areas of the image. This is correctly referred to as dynamic rage not simply brightness or contrast. It is hard to truly internalize the differences between the displays without seeing them side by side, because it isn't simply a matter of showing more exposure latitude in the image. You can do that on any display at any brightness by compressing the dynamic range into the displayable range. An HDR monitor is displaying dark element of the frame like books on a bookshelf in shadow at a very similar overall light output as an HD monitor, and a bright element like a white wall also at a very similar overall light output as the HD monitor. What's different is that the HDR monitor can keep going in both directions. Back to the shot from "Mozart in the Jungle". Between the monitors the dark books look about the same and the light walls look about the same, but the stained glass window in the background is completely different. On the HD monitor the window blooms into bright overexposure looking exactly like what you'd expect by shooting in a dark room with a bright window. The HDR monitor however hits that brightness and more, showing the beautiful colors of the stand glass window not by crushing the brightness into a displayable range but by literally outputting more light. At up to 1100 nits the colors of that stand glass window are explosive. As I was sitting in that room with the various displays showing the same shot, the stained glass window on the HDR monitor was by far the brightest thing in the room, and the colors unbelievable. On top of this, the darkest elements in that image in the shadows of the bookshelves are some of the darkest things in the room yet the colors and details are still visible. It is an amazing thing to see. HDR for TV is not a technical improvement that looks like crap like high frame rate and motion smoothing, or a numbers game that's more or less superfluous for TV size images like 4k vs 2k. HDR as actually higher light output, is a real improvement both creatively and technically. So what's the difference? The difference is that the way we used HDR for capture and manipulation of images was originally mostly intended to mean recording absolute light values outside of any concept of displayability. It is the secondary effects of that capture that are visible. For example the ability to use an image as a light source in a cg rendering because the light sources captured in the HDR image are recorded with their actual values and in proper proportion to the reflected light in the image like walls and floor. Typically the difference between the light output of a light source and that of a reflection surface like a white wall is many orders of magnitude. Even a 1100 nit HDR TV is incapable of representing these ranges literally in most cases, and it's doubtful that you'd want it to. What's being shown is the additional latitude that has been part of the image all along, including and especially film, but not displayable in the final result without having negative affects on the 'look' of the image such as reducing the contrast. This gives us post processing latitude for moving exposure up and down and adjusting color without too many artifacts in bright or dark areas. As is the case with the shot from "Mozart in the Jungle" HDR tvs and the new standards such as REC 2020 for tv and P3 for digital cinema are delivering more of what was already captured in the extended latitude (shoulder and heal) of the film or sensor used. Unlike HDRI, none of this requires a significantly different capture process. Although, DPs and directors will definitely want to start taking it into account. Kind of in a similar way that HD had an impact on the makeup department. Scenes with low contrast such as characters talking in a normally lit interior shot should appear almost identical even in a side by side comparison (give or take overall brightness). 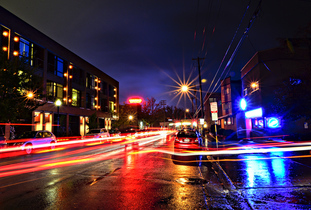 Shots like this may demonstrate improved color on an HDR tv but the differences will typically be too subtle to notice. Scenes with visible light sources or dramatic use of color; day exteriors with sky, nighttime club scenes with neon and stage lighting, just about anything by David Fincher, all will look dramatically different on HDR TVs, but not because the contrast has been cranked up, the contrast should seem roughly the same as a good HD tv, the darks and lights just go further. Existing (REC 709) content should look generally the same between HD and HDR tvs. If they don't something is wrong with the setup of one or both of them. Post color must be redone to include the additional range, and only that shows off the real power of HDR tvs. *sniff* I smell a marketing tactic. So, let's start off with HDR: what is it? An HDR image is about increasing the dynamic contrast in a picture and therefore the number of stops. There are different ways of capturing this, but you can search the site for that. So we have our HDR image, now what do we do with it? We need some sort of medium to present it otherwise it does us no good. LCD screens only have a certain contrast ratio and will only display so many stops. What this TV is advertising is that it goes beyond the competitors' contrast ratios and allows for more stops to be visible. It is a gimmick, but if you do a lot slide shows then it might be worth it. Not the answer you're looking for? Browse other questions tagged terminology hdr or ask your own question. Would a standard luminosity (max. 200 cd) HDR TV make sense? What is it called when multiple photos are adjusted for further blending? How do I shoot massive bonfire in order to produce an HDR image? Why is my HDR image oversaturated and look negative inverse in highlight areas?